Any child born today has a bright future ahead of them—mostly consisting of watching glowing rectangles for 80 or 90 years. To give his progeny a jump-start on a lifetime of watching LEDs flicker, [Dan] created a busy box. 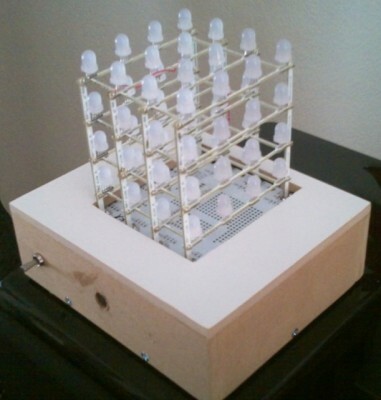 It’s really just an Arduino, RGB LED matrix, and a programmed particle system, but if we’re fascinated by it, it will probably blow an infant’s mind. The idea for this busy box originated with an earlier Hackaday post that used an 8×8 matrix of RGB LEDs to create a moving color cloud. [Dan] took this project as a jumping off point and created an infant’s busy box with four modes that are sure to be entertaining. 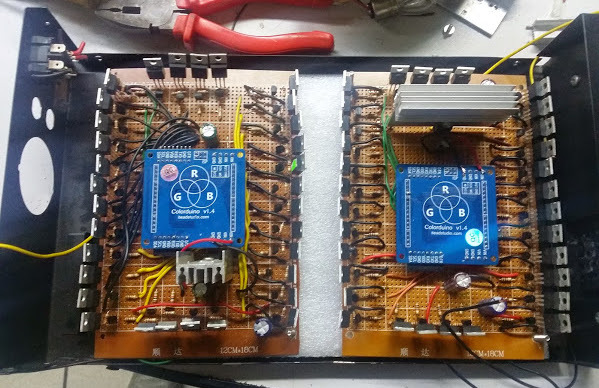 Inside the is a Rainboduino: an Arduino compatible board capable of driving an 8×8 RGB LED matrix. Also stuffed inside the busy box is a 9V battery, rocker switch for the power, and four arcade buttons that cycle through each mode. The first mode is some sort of ‘plasma cloud’ simulation, the next is a ‘painter’ light display. The final two modes spell out [Dan]’s spawn’s name, and all the numbers and letters of the alphabet. This is just an 8×8 LED matrix, but the size and execution make it look marvelous. [Michu] built this module using foam board dividers to separate the cells, a foam board back to host the 64 RGB LEDs, and a sheet of heavy frost diffusion gel that is a stage lighting product. 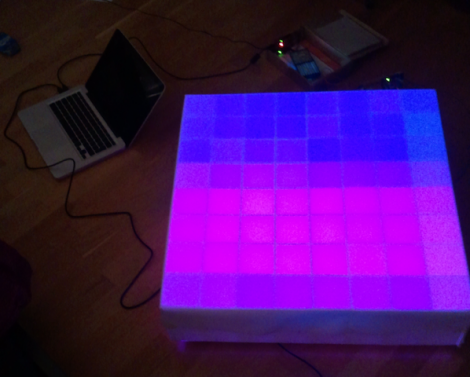 The display is driven by a Rainbowduino with input from a processing sketch. The effects seen in the video after the break are quite pleasing, and are just begging to be installed in your next coffee table project.